For other uses, see Areopagus (disambiguation). 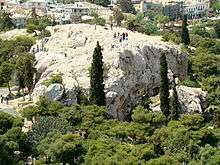 The Areopagus (/ˌæriˈɒpəɡəs/) is a prominent rock outcropping located northwest of the Acropolis in Athens, Greece. Its English name is the composite form of the Greek name Areios Pagos, translated "Ares Rock" (Ancient Greek: Ἄρειος Πάγος). In classical times, it functioned as the court for trying deliberate homicide. Ares was supposed to have been tried here by the gods for the murder of Poseidon's son Halirrhothius (a typical example of an aetiological myth). The origin of its name is not clear. In Ancient Greek, πάγος pagos means "big piece of rock". Areios could have come from Ares or from the Erinyes, as on its foot was erected a temple dedicated to the Erinyes where murderers used to find shelter so as not to face the consequences of their actions. Later, the Romans referred to the rocky hill as "Mars Hill", after Mars, the Roman God of War. Near the Areopagus was also constructed the basilica of Dionysius Areopagites. In pre-classical times (before the 5th century BC), the Areopagus was the council of elders of the city, similar to the Roman Senate. Like the Senate, its membership was restricted to those who had held high public office, in this case that of Archon. In 594 BC, the Areopagus agreed to hand over its functions to Solon for reform. He instituted democratic reforms, reconstituted its membership and returned control to the organization. In 462 BC, Ephialtes put through reforms which deprived the Areopagus of almost all its functions except that of a murder tribunal in favour of Heliaia. In The Eumenides of Aeschylus (458 BC), the Areopagus is the site of the trial of Orestes for killing his mother (Clytemnestra) and her lover (Aegisthus). Phryne, the hetaera from 4th century BC Greece and famed for her beauty, appeared before the Areopagus accused of profaning the Eleusinian mysteries. One story has her letting her cloak drop, so impressing the judges with her almost divine form that she was summarily acquitted. In an unusual development, the Areopagus acquired a new function in the 4th century BC, investigating corruption, although conviction powers remained with the Ecclesia. The term "Areopagus" also refers to the judicial body of aristocratic origin that subsequently formed the higher court of modern Greece. The English poet John Milton titled his defence of freedom of the press "Areopagitica," arguing that the censors of ancient Athens, based at the Areopagus, had not practiced the kind of prior restraint of publication being called for in the English Parliament of Milton's time. Areopagus of Eastern Continental Greece, a regional Greek administration during the Greek Revolution of 1821, which was named after the Ancient Athenian institution. ↑ "Areopagus • WebBible Encyclopedia • ChristianAnswers.Net". ↑ Pseudo-Aristotle. "Atheneion Politeia". Perseus. Perseus Tufts. Retrieved 8 February 2016. ↑ Ancient Greece:Athens Archived December 3, 2010, at the Wayback Machine. 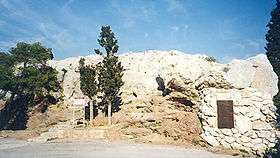 Wikimedia Commons has media related to Areopagus.